The ataxia telangiectasia mutated (ATM) kinase and H2AX histone tumor suppressor proteins are each critical for maintenance of cellular genomic stability and suppression of lymphomas harboring clonal translocations. ATM is the predominant kinase that phosphorylates H2AX in chromatin around DNA double-strand breaks, including along lymphocyte Ag receptor loci cleaved during V(D)J recombination. However, combined germline inactivation of Atm and H2ax in mice causes early embryonic lethality associated with substantial cellular genomic instability, indicating that ATM and H2AX exhibit nonredundant functions in embryonic cells. To evaluate potential nonredundant roles of ATM and H2AX in somatic cells, we generated and analyzed Atm-deficient mice with conditional deletion of H2ax in αβ T-lineage lymphocytes. Combined Atm/H2ax inactivation starting in early-stage CD4–/CD8– thymocytes resulted in lower numbers of later-stage CD4+/CD8+ thymocytes, but led to no discernible V(D)J recombination defect in G1 phase cells beyond that observed in Atm-deficient cells. H2ax deletion in Atm-deficient thymocytes also did not affect the incidence or mortality of mice from thymic lymphomas with clonal chromosome 14 (TCRα/δ) translocations. Yet, in vitro-stimulated Atm/H2ax-deficient splenic αβ T cells exhibited a higher frequency of genomic instability, including radial chromosome translocations and TCRβ translocations, compared with cells lacking Atm or H2ax. Collectively, our data demonstrate that both redundant and nonredundant functions of ATM and H2AX are required for normal recombination of TCR loci, proliferative expansion of developing thymocytes, and maintenance of genomic stability in cycling αβ T-lineage cells. Conserved features of the cellular DNA damage response (DDR) to double-strand breaks (DSBs) are activation of the ataxia telangiectasia mutated (ATM) kinase and its phosphorylation of H2AX in chromatin around breakage sites. ATM-mediated phosphorylation of H2AX enables subsequent histone modifications that nucleate assembly of other DDR proteins into complexes around DSBs (1). ATM-mediated phosphorylation of these and other substrates including the p53 tumor suppressor activates cell cycle checkpoints, promotes DSB repair, and induces apoptosis if DNA damage is too severe (2). Cellular ATM deficiency leads to increased genomic instability, impaired cell cycle checkpoints, and defective p53-mediated apoptosis (3, 4), whereas germline ATM inactivation causes highly elevated predisposition to lymphoid cancers with clonal translocations (5–10). Cellular H2AX deficiency leads to increased genomic instability and a defect in the G2/M checkpoint but does not alter p53-mediated apoptosis (11–15), whereas germline H2AX inactivation only causes a slightly increased cancer predisposition (12). These findings indicate that ATM preserves genomic stability and suppresses transformation through H2AX-dependent and H2AX-independent mechanisms. The ATM-related kinases DNA-PKcs and ATR also phosphorylate H2AX (16, 17), suggesting that H2AX may exhibit ATM-independent DDR functions. Consistent with this notion, combined germline inactivation of Atm and H2ax caused embryonic lethality and increased genomic instability in embryonic cells compared with Atm or H2ax deficiency (18). This elevated genomic instability was associated with a requirement for ATM-dependent H2AX functions to repair oxidative DNA damage (18). These Atm/H2ax-deficient cells exhibited a slight increase in chromosome breaks compared with Atm-deficient cells and a substantial increase in chromatid breaks compared with H2ax-deficient cells (18). Considering that chromosome breaks predominantly arise from G1 phase DSBs and chromatid breaks generally derive from S/G2 phase DSBs, the genomic instability pattern of Atm/H2ax-deficient embryonic cells suggests that ATM and H2AX have redundant functions in DSB repair through non-homologous end-joining (NHEJ) yet nonredundant functions in homologous recombination (HR). Because DDR mechanisms exhibit tissue-specific differences (19), additional studies are required to assess potential redundant and nonredundant functions of ATM and H2AX in somatic cells. In mice and humans, αβ and γδ T cells develop in the thymus from common progenitor cells through programs that link the assembly of TCR genes with differentiation (20). TCRβ, TCRγ, and TCRδ genes are assembled from variable (V), diversity (D), and joining (J) gene segments in CD4−/CD8− “double-negative” (DN) thymocytes (20). V(D)J recombination is initiated by the RAG1/RAG2 (RAG) endonuclease, which induces DSBs adjacent to participating segments, and is completed by NHEJ proteins, which repair RAG DSBs to form V(D)J coding exons upstream of constant (C) exons (21). Assembly and expression of functional TCRγ and TCRδ genes generates γδ TCRs that promote differentiation into mature γδ T cells (22). In contrast, assembly and expression of functional TCRβ genes leads to TCRβ/pre-Tα (pre-TCR) complexes and β-selection signals that drive proliferative expansion as cells differentiate into CD4+/CD8+ “double-positive” (DP) thymocytes (20). This TCRβ-dependent proliferation is associated with spontaneous replication-associated DSBs that must be repaired by HR for normal DN-to-DP thymocyte expansion (23). Assembly and expression of functional TCRα genes in DP cells leads to formation of αβ TCRs, which upon their selection signal differentiation into CD4+ or CD8+ “single-positive” (SP) thymocytes that exit the thymus as CD4+ or CD8+ mature αβ T cells (20). In developing αβ T cells, ATM and H2AX each suppress oncogenic translocations arising from aberrant repair of DSBs during NHEJ and HR. Germline Atm-deficient (Atm–/–) and H2ax-deficient (H2ax–/–) mice each exhibit fewer numbers of thymocytes and αβ T cells due to impaired proliferation of cells lacking Atm or H2ax (6, 9, 10, 12–14, 24). Atm–/–, but not H2ax–/–, mice exhibit a severe defect in DP-to-SP development due to H2AX-independent functions of ATM during coding join formation in G1 phase cells (6, 9, 10, 13, 14, 24–26). Almost all Atm–/– mice succumb to thymic lymphomas with clonal chromosome 14 translocations created through aberrant repair of DSBs induced by RAG during TCRδ recombination and by DNA replication errors during thymocyte expansion (7, 8). In contrast, despite H2AX phosphorylation by ATM and DNA-PKcs along RAG-cleaved Ag receptor loci (27), H2ax–/– mice rarely succumb to these or other tumors due to ATM/p53-dependent activation of checkpoints and apoptosis (12–14). To investigate potential redundant and nonredundant DDR functions of ATM and H2AX in somatic cells, we generated and analyzed Atm–/– mice with conditional deletion of H2ax in developing αβ T lymphocytes. We show that combined Atm/H2ax deletion starting in DN thymocytes results in lower numbers of DP thymocytes without causing a V(D)J recombination defect beyond that observed in Atm-deficient cells. We also show that H2ax deletion in Atm-deficient thymocytes does not affect the incidence or mortality of mice from thymic lymphomas with clonal chromosome 14 translocations. Yet, we find that proliferating Atm/H2ax-deficient αβ T cells exhibit a higher frequency of genomic instability, including radial chromosome translocations and TCRβ translocations, relative to cells lacking Atm or H2ax. Collectively, our data demonstrate that both redundant and nonredundant functions of ATM and H2AX are required for normal TCR recombination, proliferative expansion of developing thymocytes, and maintenance of genomic stability in cycling αβ T-lineage cells. Lck-cre transgenic (28), Atm–/– (24), and H2axF/F (12) mice were bred to generate the animals in this study. The background strain of these mice was mixed 129SvEv and C57BL/6, with the 129SvEv background predominant. PCR analyses of H2ax deletion were performed as described (12), demonstrating complete deletion of H2ax in Lck-creAtm–/– and Lck-creAtm–/–H2axflox/flox αβ T-lineage cells. Experiments were conducted on 4- to 6-wk-old mice of each genotype, performed in accordance with national guidelines, and approved by the Institutional Animal Care and Use Committee of the Children's Hospital of Philadelphia. Single-cell suspensions from thymuses and spleens of 4- to 6-wk-old mice or tumors were stained with Abs in PBS with 2% FBS. For analysis of CD4 and CD8 expression, single-cell suspensions of thymocytes and splenocytes were stained with FITC-conjugated anti-TCRβ, PE-conjugated anti-CD8, and allophycocyanin-conjugated anti-CD4 (BD Pharmingen). Data were collected using a FACSCalibur (BD Biosciences, San Jose, CA) and CellQuest software (BD Biosciences) and analyzed using FlowJo software (Tree Star). Bone marrow from 3- to 5-wk-old Atm−/−H2axF/F mice harboring the Eμ-Bcl-2 transgene were cultured and infected with the pMSCV v-abl retrovirus to generate Abelson transformed (abl) pre-B cell lines as previously described (25). Generation of the H2ax−/− abl pre-B cells was previously described (29). H2ax−/− and Atm−/−H2axF/F abl pre-B cells containing pMX-DELCJ retroviral recombination substrates were made as described (25). Atm−/−H2ax−/− abl pre-B cells containing pMX-DELCJ were created through Tat-Cre induction of Atm−/−H2axF/F:pMX-DELCJ abl pre-B cells as previously described (29). Southern blot analysis was performed upon abl pre-B cells after treatment with 3 μM STI571 for the indicated times at a density of 106 cells/ml, as previously described (25). Genomic DNA (20–30 μg) of thymocytes, tumors, or kidneys was digested with 100 U of the indicated enzymes (New England Biolabs), separated on a 1.0% TAE agarose gel, transferred onto ζ-probe membrane (Bio-Rad), and hybridized with 32P-labeled DNA probes as described (12). Metaphase spreads were prepared as described. Spectral karyotyping and chromosome painting were performed according to the manufacturer’s instructions (Applied Spectral Imaging). BAC fluorescence in situ hybridization (FISH) probes were labeled with biotin (Biotin-Nick Translation Mix; Roche). The TCR-Cβ-164G11 BAC used for FISH has been described (30). Images were captured and analyzed using Case Data Manager version 5.5 configured by Applied Spectral Imaging. The Kaplan–Meier curves were generated in SAS version 9 (SAS Institute). Statistical analyses were performed with two-tailed unpaired Student t tests in Excel (Microsoft) or Prism (AMPL Software). We considered p < 0.05 to be statistically significant. Because the Lck-cre transgene promotes deletion of “floxed” H2ax (H2axF) genes in DN cells prior to V(D)J recombination (29), we sought to generate and analyze Lck-cre+/−Atm−/−, Lck-cre+/−H2axF/F, and Lck-cre+/−Atm−/−H2axF/F mice. Atm and H2ax are closely linked on chromosome 9, therefore we first bred together Atm+/– and H2axF/F mice to generate Atm+/–H2ax+/F males containing the Atm− and H2axF alleles on different chromosomes. These Atm+/–H2ax+/F males were crossed with wild-type females to select for meiotic crossover events that created Atm+/–H2axF/+ mice with the Atm– and H2axF alleles linked on the same chromosome. We frequently observe deletion of H2axF genes in nonlymphoid cells when Lck-cre is transmitted maternally, but not when transmitted paternally (data not shown). Thus, to avoid nonspecific H2ax deletion, as well as potential complications due to homozygous Lck-cre transgene integration, we bred heterozygous Lck-cre males with Atm+/–H2axF/+ females to generate Lck-cre+/−Atm+/–H2axF/+ mice. Because Atm–/– mice are infertile (6, 9, 10, 24), we bred Lck-cre+/–Atm+/–H2axF/+ males with Atm+/–H2axF/+ females to generate experimental Lck-cre+/−Atm–/–H2axF/F mice, hereafter referred to as LAH mice. We used a similar breeding strategy to generate control Lck-cre+/−Atm–/– and Lck-cre+/−H2axF/F mice, hereafter referred to as LA and LH mice, respectively. To assess potential redundant and nonredundant functions of ATM and H2AX in αβ T-lineage cells, we first analyzed the thymuses and spleens of LA, LH, and LAH mice by cell counting and flow cytometry (FACS) analysis with anti-CD4 and anti-CD8 Abs. We found that LH and wild-type mice exhibited comparable numbers of total thymocytes, cells within each thymocyte developmental stage, and splenic αβ T cells (data not shown). We detected ∼2-fold lower numbers of total thymocytes and splenic αβ T cells in LA mice compared with LH mice (Fig. 1). The fewer numbers of LA thymocytes reflected an ∼2-fold reduction in DP cells and ∼5-fold reductions in CD4+ SP and CD8+ SP cells (Fig. 1A, 1B). These data are consistent with the phenotypes of Atm–/– and H2ax–/– mice (6, 9, 10, 12–14, 24), indicating that Lck-cre expression has negligible effects upon the development of αβ T cells lacking Atm or H2ax. We found that the average numbers of thymocytes and splenic αβ T cells in LAH mice were each reduced ∼2-fold compared with LA mice and ∼4-fold compared with LH mice (Fig. 1), although the difference in numbers of LA and LAH splenic αβ T cells was not significant from the numbers of mice analyzed. Notably, as compared with LA mice, LAH mice contained an ∼2-fold reduction in DP cell numbers, yet showed no significant differences in DN, CD4+ SP, or CD8+ SP cell numbers (Fig. 1A, 1B). These observations indicate that TCRβ-dependent DN-to-DP thymocyte expansion is more impaired in Atm/H2ax-deficient cells than in Atm–/– or H2ax–/– cells. This difference may reflect nonredundant ATM and H2AX functions in coding join formation during TCRβ recombination and/or repair of replication-associated DSBs during TCRβ-driven cellular proliferation. ATM and H2AX exhibit nonredundant functions during DN-to-DP thymocyte expansion. 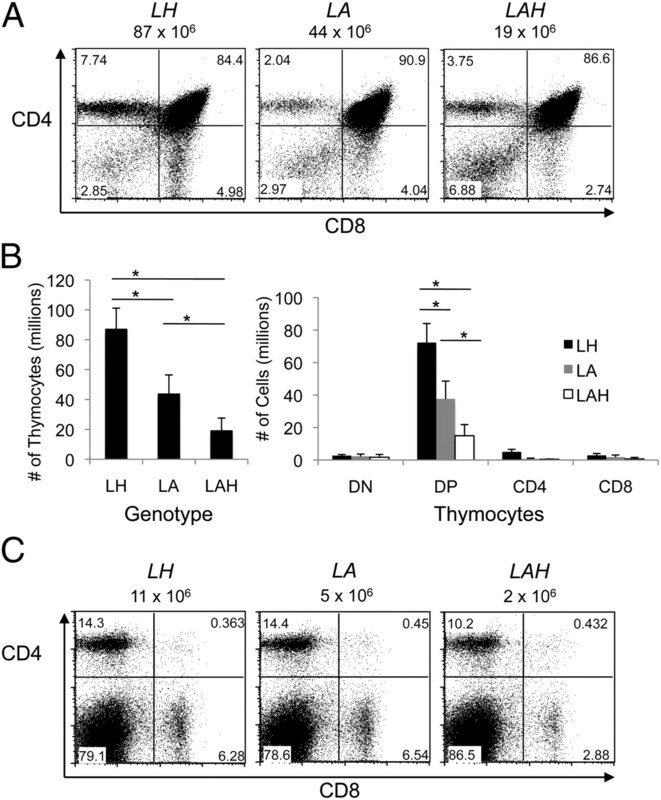 (A) Representative CD4/CD8 FACS data of thymocytes from LH, LA, and LAH mice. The average numbers of total thymocytes, the DN, DP, CD4+ SP, and CD8+ SP cell quadrants, and the percentages of thymocytes within each of these quadrants are indicated. (B) Graphs showing the average numbers of total thymocytes or DN, DP, CD4+ SP, and CD8+ DP thymocytes from LH, LA, and LAH mice. Error bars are SE. *p < 0.05. (C) Representative CD4/CD8 FACS data of splenocytes from LH, LA, and LAH mice. The average numbers of total αβ T cells, CD4+ and CD8+ quadrants, and the percentages of splenocytes within each of these quadrants are indicated. Each experiment in this figure was done at least five independent times on at least one mouse of each genotype. The similar defect in the DP-to-SP thymocyte differentiation step in LAH and LA mice suggests that combined Atm/H2ax deletion does not impair coding join formation during TCRα recombination beyond that observed in Atm–/– thymocytes. Analysis of chromosomal V(D)J recombination in abl pre-B cells enables distinction between NHEJ defects in G1 phase cells and impaired cellular proliferation after the assembly, expression, and selection of functional Ag receptor genes (25). Therefore, to obtain direct evidence that H2ax deletion does not impair coding join formation beyond that observed in Atm–/– cells, we sought to analyze chromosomal V(D)J recombination among H2ax–/–, Atm–/–, and Atm–/–H2ax–/– abl pre-B cells. For this purpose, we established abl pre-B cell lines from Atm–/–H2axF/F mice and incubated these with TAT-Cre protein to delete H2axF genes, generating otherwise identical Atm–/–H2ax–/– abl pre-B cells. We infected the parental Atm–/–H2axF/F and derivative Atm–/–H2ax–/– abl pre-B cells, as well as previously established H2ax–/– abl pre-B cells (29), with the pMX-DELCJ retroviral V(D)J recombination substrate (Fig. 2A) (25). Rearrangement of pMX-DELCJ in wild-type cells results in formation of a chromosomal coding join (CJ) through coding end (CE) intermediates (Fig. 2A). We treated populations of H2ax–/–, Atm–/–H2axF/F, and Atm–/–H2ax–/– abl pre-B cells containing chromosomally integrated pMX-DELCJ with STI571 for 48 or 96 h. We then conducted Southern blot analysis to identify and quantify substrates that rearranged to form CJs, accumulated unrepaired CEs, or were unrearranged. Consistent with our previous observations (29), we found that CJ formation was normal in G1 phase H2ax–/– cells but defective in G1 phase Atm–/– cells due to accumulation of unrepaired CEs (Fig. 2B). Notably, we detected no obvious differences in the ratio of unrepaired CEs to repaired CJs in G1 phase Atm–/–H2ax–/– cells compared with G1 phase Atm–/– cells (Fig. 2B). These results confirm that combined Atm/H2ax inactivation does not impair chromosomal CJ formation in G1 phase cells substantially beyond that detected in Atm–/– cells. Collectively, our data indicate that ATM and H2AX do not exhibit redundant functions during NHEJ-mediated repair of RAG DSBs in G1 phase lymphocytes, yet they exhibit overlapping functions during proliferative expansion of TCRβ-selected thymocytes. Atm−/− and Atm−/−H2ax−/− cells exhibit similar defects in CJ formation in G1 phase cells. (A) Schematic diagrams of the pMX-DELCJ retroviral substrate in the unrearranged (UR), recombined (CJ), and unrepaired (CE) configurations. Coding sequences are shown as open boxes and recombination signal sequences as triangles. Arrows represent the LTR sequences. Indicated are the relative positions of the EcoRV sites (RV) and C4 probe used for Southern blotting and the sizes of the C4-hybridizing EcoRV fragments from pMX-DELCJ in the UR, CE, and CJ configurations. (B) Southern analysis of pMX-DELCJ recombination in H2ax−/−, Atm−/−, and Atm−/−H2ax−/− abl pre-B cells untreated or treated with STI517 for 48 or 96 h. Bands corresponding to fragments obtained from pMX-DELCJ substrates of the UR, CE, and CJ configurations are indicated. This experiment was performed once on pools of infected H2ax−/−, Atm−/−, and Atm−/−H2ax−/− abl pre-B cells. Almost all Atm–/– mice succumb by 6 mo of age to thymic lymphomas (6, 9, 10, 24), whereas H2ax–/– mice rarely succumb to cancer within the first year of life (12–14). Thus, to evaluate potential nonredundant functions of ATM and H2AX in suppression of αβ T-lineage lymphoma, we generated and analyzed parallel cohorts of 20 LA and 27 LAH mice. Although we did not assess a parallel cohort of LH mice, we have never observed any tumors in LH mice (data not shown). We found that LA and LAH mice survived tumor-free between 75 and 145 d with both genotypes exhibiting a median age of mortality around 85 d (Fig. 3A). All 20 LA cohort mice succumbed to thymic lymphomas that showed no dissemination to peripheral lymphoid organs (Supplemental Table I), similar to the tumor phenotype of Atm–/– mice (6, 9, 10, 24). Of the 27 LAH cohort mice, 25 succumbed to thymic lymphomas, one succumbed to a peripheral lymphoma, and another succumbed to a sarcoma (Supplemental Table II). These observations demonstrate that Atm–/– mice and Atm–/– mice with H2ax deletion initiating in DN thymocytes exhibit similar predisposition to spontaneous thymic lymphomas. LA and LAH mice exhibit similar genetic predisposition to spontaneous thymic lymphoma. (A) Kaplan–Meier curves depicting the tumor-free percent survival of LA (n = 20) and LAH (n = 27) mice. (B) Southern analysis of TCRβ rearrangements conducted on HindIII-digested genomic DNA isolated from the indicated LAH thymic lymphomas. Above the blots is a schematic diagram of the TCRβ locus indicating the relative locations of the HindIII sites (H3) and the 3′Jβ1 and 3′Jβ2 probes. Indicated next to the blots are the locations of the band corresponding to unrearranged (UR) Jβ1 and Jβ2 segments. (C) SKY image of a representative metaphase from LAH thymic lymphoma no. 798. White circles label the clonal t (12, 14) and t (14, 15) translocations. (D) SKY image of a representative metaphase from LAH thymic lymphoma no. 590. White circles label the clonal t (4, 14), t (14, 16), and t (14, 4, 16) translocations. Each of these experiments was conducted once. SKY images were obtained from at least 10 metaphases from cells of each tumor. Thymic lymphomas of Atm–/– mice are clonal malignancies that contain TCRβ rearrangements, lack surface TCRβ expression, and consist of CD4+/CD8+, CD4–/CD8+, and/or CD4+/CD8– cells (6–10, 24). To evaluate whether H2ax-deletion affects the phenotype of Atm–/– thymic lymphomas, we determined the clonality and developmental stage of LAH and LA tumors. Most of the 19 LAH and 19 LA lymphomas analyzed by Southern blotting contained two TCRβ alleles with rearrangements involving Dβ1-Jβ1 segments (Fig. 3B; data not shown). The others contained another rearrangement involving Dβ2-Jβ2 segments and/or deleted TCRβ locus sequences (Fig. 3B; data not shown). Southern blot analysis also confirmed H2ax deletion in all LAH tumors analyzed (data not shown), demonstrating these cells lacked both Atm and H2ax. Of the 17 LA and 21 LAH thymic lymphomas analyzed by flow cytometry, most were TCRβ– and similarly composed of CD4+/CD8+, CD4–/CD8+, and/or CD4+/CD8– cells (Supplemental Tables I, II). Collectively, these data reveal that Atm–/– mice and Atm–/– mice with H2ax deletion DN cells succumb to clonal αβ T-lineage tumors of similar developmental stages. Most Atm–/– thymic lymphomas harbor clonal chromosome 14 translocations formed by aberrant repair of RAG DSBs induced during TCRδ recombination in DN thymocytes and additional clonal and nonclonal translocations generated through aberrant repair of replication-associated DSBs (7, 8). To assess whether deletion of H2ax in Atm–/– DN thymocytes affects the translocation pattern of Atm–/– thymic lymphomas, we conducted spectral karyotyping (SKY) on metaphases prepared from four LA and five LAH tumors. Three LA thymic lymphomas contained clonal chromosome 14 translocations, as well as other clonal or nonclonal translocations (Table I); the other harbored clonal t (15, 6), t (12, 7), and t (4, 15) translocations and several nonclonal translocations (Table I). This pattern of translocations is similar to that observed in Atm–/– tumors (7, 8), indicating that Lck-cre expression does not substantially affect the type or frequency of translocations that arise in Atm–/– thymic lymphomas. Four LAH tumors harbored clonal chromosome 14 translocations and many nonclonal translocations (Fig. 3C, Table II). The remaining LAH thymic lymphoma lacked clonal translocations but contained numerous nonclonal translocations (Fig. 3D, Table II). These findings indicate that LA and LAH tumors exhibit similar patterns of translocations compared with each other and with Atm−/− thymic lymphomas. Thus, we conclude that conditional H2ax deletion in Atm−/− thymocytes does not substantially affect the incidence or mortality of mice from thymic lymphomas with clonal chromosome 14 translocations. ATM-independent H2AX functions protect Atm−/− embryonic cells from genomic stability arising from DSBs induced before, during, and after DNA replication (18). To evaluate whether ATM-independent H2AX functions similarly maintain genomic stability in somatic cells, we conducted SKY on large numbers of metaphase spreads prepared from in vitro-stimulated LA, LH, or LAH splenic αβ T cells. We quantified chromosome breaks, chromatid breaks, detached centromeres, chromosome fusions, and translocations, as these types of chromosomal abnormalities arise from unrepaired or misrepaired DSBs (Table III). We found that a higher percentage of LAH metaphases contained such chromosome abnormalities relative to LH (41 versus 23%, p = 0.0001) or LA (41 versus 23%, p < 0.0001) metaphases (Fig. 4A). The average number of such abnormalities per metaphase also was higher for LAH cells compared with LH (0.68 versus 0.34, p = 0.0001) or LA (0.68 versus 0.33, p < 0.0001) metaphases (Table III). In addition, the frequency of each abnormality was greater in LAH metaphases relative to LA and LH metaphases (Supplemental Table III). Consequently, this cytogenetic analysis demonstrates that nonredundant functions of ATM and H2AX maintain genomic stability in proliferating mature αβ T cells. ATM and H2AX exhibit nonredundant functions in maintenance of genomic stability in proliferating αβ T cells. (A) Graph showing the average percentages of metaphases with chromosome abnormalities in metaphases prepared from in vitro-stimulated LH, LA, and LAH splenic αβ T cells. Error bars are SE. This experiment was conducted three independent times on cells from one mouse of each genotype. 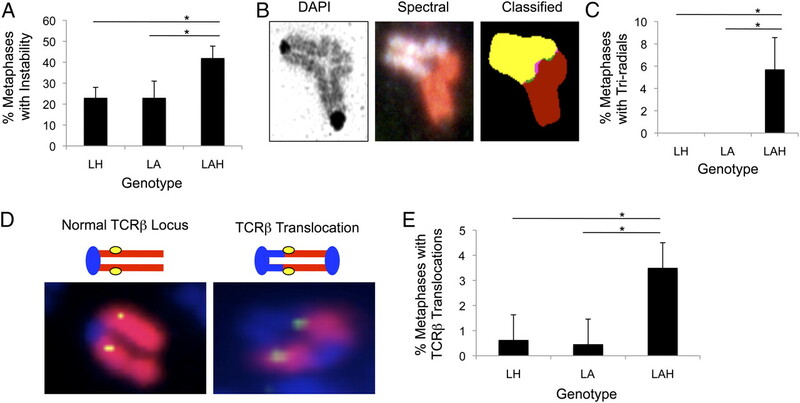 (B) DAPI, spectral, and classified SKY images of a tri-radial chromosome translocation observed in metaphases from LAH αβ T cells. (C) Graph showing the numbers of tri-radial translocations detected in metaphases prepared from in vitro-stimulated LH, LA, and LAH splenic αβ T cells. Error bars are SE. This experiment was conducted three independent times on cells from one mouse of each genotype. (D) Schematic and cytogenetic images of a normal chromosome 6 and a dicentric translocation involving the TCRβ locus on chromosome 6 detected in metaphases from LAH αβ T cells. Metaphases were stained with DAPI (blue) to label chromosomes, whole chromosome 6 paints (red) to identify chromosome 6 material, and 3′TCRβ FISH probes (yellow) to detect these TCRβ sequences. (B and D) Original magnification ×60. (E) Graph showing the numbers of TCRβ translocations detected in metaphases prepared from in vitro-stimulated LH, LA, and LAH splenic αβ T cells. Error bars are SE. This experiment was conducted three independent times on cells from one mouse of each genotype. *p < 0.05. Although most abnormalities were nonrecurrent, we observed higher frequencies of two types of chromosomal lesions in LAH metaphases compared with LA and LH metaphases. We detected radial chromosome translocations involving aberrant fusion and cohesion of heterologous chromatids in 5.5% of LAH metaphases but not in any LA or LH metaphases (5.5% versus 0, p = 0.0005) (Fig. 4B, 4C). These radial translocations arise in HR-defective backgrounds and form when chromatid breaks are not repaired via HR but instead aberrantly joined via NHEJ before G2/M (31). Thus, our detection of radial translocations in LAH, but not LA or LH, metaphases reveals that ATM and H2AX have nonredundant functions during HR in proliferating αβ T cells. The Ag receptor loci that recombine in developing αβ T cells are located on chromosomes 6 (Tcrβ), 13 (Tcrγ), 14 (Tcrα/δ), and 12 (Igh). We detected similar frequencies of translocations involving chromosomes 13, 14, and 12 among LH, LA, and LAH metaphases (Supplemental Table IV). Notably, we observed a higher frequency of chromosome 6 translocations in LAH metaphases than in either LA or LH metaphases (Supplemental Table IV). To identify and quantify potential TCRβ translocations, we conducted FISH with chromosome 6 paints and a genomic DNA probe that binds downstream of Dβ-Jβ segments (3′TCRβ). We scored TCRβ translocations when 3′TCRβ FISH signals were located at breakpoints of chromosome 6 translocations (Fig. 4D). We found a greater frequency of TCRβ translocations in LAH metaphases compared with LA (3.5 versus 0.46%, p = 0.0045) or LH metaphases (3.5 versus 0.63%, p = 0.014) (Fig. 4E). Because TCRβ-selection is required for αβ T cell development, the elevated frequency of TCRβ translocations in LAH cells versus LA and LH cells demonstrates that nonredundant functions of ATM and H2AX suppress the aberrant repair of RAG DSBs induced on nonselected TCRβ alleles. For reasons explained in the Discussion, we conclude from our data that nonredundant functions of ATM and H2AX protect proliferating αβ T-lineage cells from genomic stability initiated by spontaneous and programmed DSBs. In this study, we generated and analyzed Atm-deficient mice and cells with conditional deletion of H2ax to assess potential redundant and nonredundant functions of ATM and H2AX in developing lymphocytes. We had previously demonstrated that G1 phase Atm−/−, but not H2ax−/−, abl pre-B cells exhibit defects in chromosomal CJ formation (25, 29). In the current study, we showed that Atm−/−H2ax−/− and Atm−/− abl pre-B cells display similar defects in NHEJ-mediated CJ formation in G1 phase cells. Analogous to the situation for H2AX, inactivation of the XLF DDR has no obvious effect upon CJ formation in G1 phase abl pre-B cells (19). 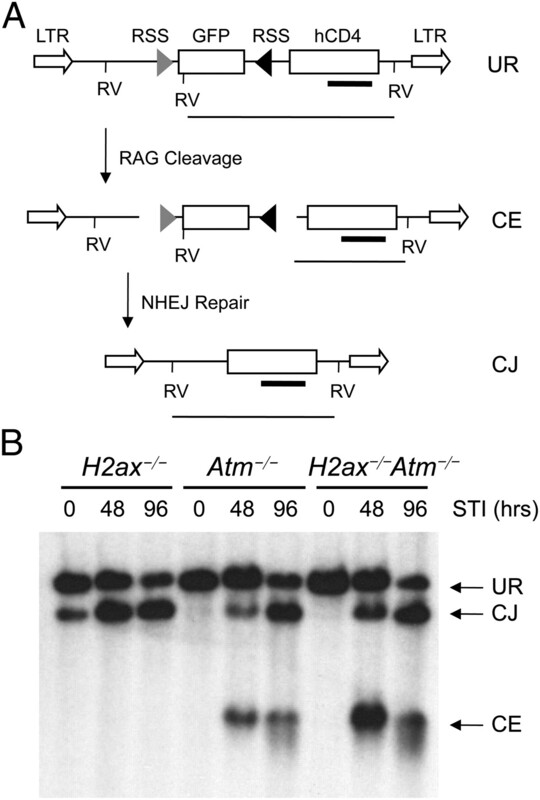 However, combined inactivation of H2ax and Xlf leads to a major defect in CJ formation that is associated with degradation of RAG-generated chromosomal CEs (32). In addition, combined inactivation of Atm and Xlf leads to a near complete block in chromosomal CJ formation in G1-arrested abl pre-B cells (32). These XLF studies revealed that XLF has essential nonredundant functions with ATM and H2AX during chromosomal CJ formation in G1 phase cells. Because the identical assay was used in these experiments and our current study, our results provide strong evidence that ATM promotes NHEJ-mediated CJ formation in G1 phase lymphocytes through mechanisms that are not critically dependent upon H2AX. Despite showing that G1 phase Atm−/−H2ax−/− and Atm−/− lymphocytes exhibit similar defects in CJ formation, we discovered a 7-fold higher frequency of TCRβ translocations in splenic αβ T cells from LAH mice compared with LA mice. TCRβ genes are assembled in G1 phase DN cells through an ordered process where Dβ-to-Jβ recombination is followed by Vβ rearrangement to DβJβ complexes on one allele at a time (33). TCRβ gene expression from one allele selects DN thymocytes for further differentiation and drives G1-to-S progression and multiple cell cycles as cells differentiate into DP thymocytes (33). Although ATM activates the G1/S checkpoint to prevent DN cells with RAG DSBs from entering into S phase (34), a fraction of TCRβ-selected thymocytes enters S phase with unrepaired RAG DSBs induced during Vβ recombination on nonselected alleles (35). We previously showed that H2AX stabilizes RAG-cleaved DNA strands to prevent DSBs that persist into S phase from progressing into chromosome breaks and translocations during cellular proliferation (29). We also recently found that H2AX phosphorylation blocks resection of CEs to prevent RAG DSBs from entering homology-mediated repair pathways that promote translocations (36). Consequently, we conclude that, at least in ATM-deficient cells, H2AX functions downstream of DNA-PK to suppress TCRβ translocations that arise from RAG DSBs induced on nonselected TCRβ alleles in DN cells experiencing TCRβ-proliferation signals. Notably, although ∼5% of splenic αβ T cells from Atm−/− mice harbor TCRδ translocations that arise in DN thymocytes (8, 37), we found a similar frequency of chromosome 14 translocations in LAH and LA αβ T cells. These data suggest that ATM-independent H2AX functions may have a more prominent role in preventing aberrant repair of RAG DSBs induced in TCRβ loci than in TCRδ loci. Our finding that LAH mice exhibit a greater reduction of TCRβ-mediated thymocyte expansion than LA mice indicates that ATM and H2AX serve nonredundant functions in developing αβ T cells. Because ATM and H2AX have redundant functions during CJ formation in G1 phase cells, the impaired proliferative expansion of LAH thymocytes likely reflects nonredundant functions of H2AX and ATM in response to replication-associated DSBs. Our detection of radial translocations in in vitro-stimulated αβ T cells of LAH mice, but neither LA nor LH mice, indicates that ATM and H2AX exhibit nonredundant functions during HR in proliferating lymphocytes. H2AX phosphorylation by ATM and DNA-PK is required for HR repair of DNA replication-associated DSBs and restart of DNA replication (38). Thus, we conclude that the more substantial defect in TCRβ-mediated thymocyte expansion in LAH mice, compared with LA mice, is due to loss of DNA-PK–mediated H2AX functions that suppress translocations from replication-associated DSBs. Such H2AX functions could be the recruitment of HR proteins to promote rapid DNA repair and/or the cohesion of sister chromatids to prevent separation of broken DNA ends. 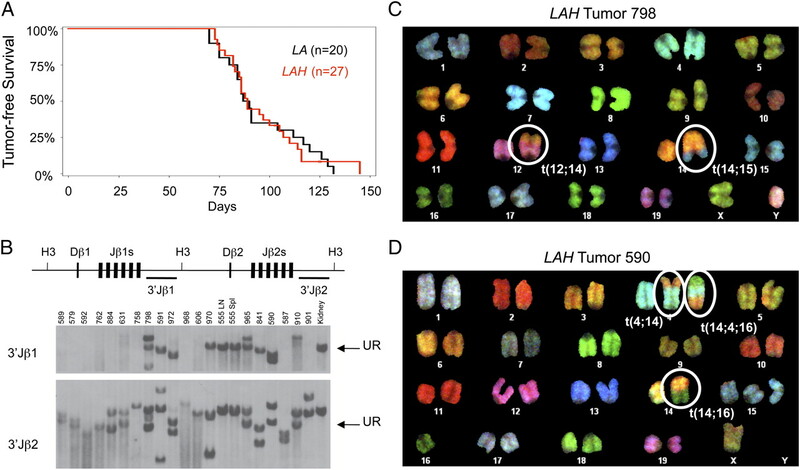 Our finding that LAH and LA mice exhibit similar mortality from thymic lymphomas with clonal chromosome 14 translocations has implications for treatment of human cancers with ATM inactivation. The clonal t (12, 14) translocations of Atm−/− thymic lymphomas delete one allelic copy of the Bcl11b haplo-insufficient tumor suppresser gene that encodes a protein required for activation of the DDR during DNA replication stress (7, 39, 40). Mutation or deletion of ATM and BCL11B often occur in human T cell acute lymphoblastic leukemia (T-ALL) (5, 41–45), whereas inactivation of only ATM is frequently observed in human T cell prolymphocytic leukemia (T-PLL) (5, 46–48). ATM inactivation in T-ALL is associated with therapy resistance and relapse (42), whereas no cure exists for T-PLL with ATM mutation (49). Clearly, the development of more effective therapies for these malignancies is warranted. Targeted inhibition of tumor cell intrinsic nonredundant DDR mechanisms holds great promise for more effective and less toxic cancer treatments (50–52). This approach leads to increased genomic instability that causes apoptosis in tumor cells while minimally affecting normal cells (50–52). Although combined inactivation of Atm and H2ax impairs cellular proliferation and causes substantial genomic instability, our data suggest that targeted inhibition of ATM-independent H2AX functions would not be an effective treatment for T-ALL tumors with ATM and BCL11B inactivation. However, additional studies are warranted to evaluate whether this strategy would be effective for other T-ALL subtypes, T-PLLs, and/or other cancers with recurrent ATM inactivation, such as mantle cell lymphoma (53). This work was supported by a Cancer Research Institute Predoctoral Emphasis Pathway in Tumor Immunology training grant awarded to the University of Pennsylvania (to B.Y. ), the Department of Pathology and Laboratory Medicine and the Center for Childhood Cancer Research of the Children’s Hospital of Philadelphia Research Institute, a grant from the Pennsylvania Department of Health, and National Institutes of Health Grants R01 CA125195 (to C.H.B.) and R01 CA136470 (to C.H.B. and B.P.S.).
. 2007. Chromatin dynamics and the preservation of genetic information. Nature 447: 951–958.
. 2010. Multiple roles of ATM in monitoring and maintaining DNA integrity. FEBS Lett. 584: 3675–3681.
. 1996. Dual roles of ATM in the cellular response to radiation and in cell growth control. Genes Dev. 10: 2401–2410.
. 1997. Genetic interactions between atm and p53 influence cellular proliferation and irradiation-induced cell cycle checkpoints. Cancer Res. 57: 1664–1667.
. 1996. Leukemia and lymphoma in ataxia telangiectasia. Blood 87: 423–438.
. 1996. Targeted disruption of ATM leads to growth retardation, chromosomal fragmentation during meiosis, immune defects, and thymic lymphoma. Genes Dev. 10: 2411–2422.
. 2010. ATM-deficient thymic lymphoma is associated with aberrant tcrd rearrangement and gene amplification. J. Exp. Med. 207: 1369–1380.
. 2000. Abnormal rearrangement within the alpha/delta T-cell receptor locus in lymphomas from Atm-deficient mice. Blood 96: 1940–1946.
. 1996. Pleiotropic defects in ataxia-telangiectasia protein-deficient mice. Proc. Natl. Acad. Sci. USA 93: 13084–13089.
. 1996. Atm-deficient mice: a paradigm of ataxia telangiectasia. Cell 86: 159–171.
. 2002. Increased ionizing radiation sensitivity and genomic instability in the absence of histone H2AX. Proc. Natl. Acad. Sci. USA 99: 8173–8178.
. 2003. Histone H2AX: a dosage-dependent suppressor of oncogenic translocations and tumors. Cell 114: 359–370.
. 2002. Genomic instability in mice lacking histone H2AX. Science 296: 922–927.
. 2003. H2AX haploinsufficiency modifies genomic stability and tumor susceptibility. Cell 114: 371–383.
. 2002. DNA damage-induced G2-M checkpoint activation by histone H2AX and 53BP1. Nat. Cell Biol. 4: 993–997.
. 2003. DNA-PK is activated by nucleosomes and phosphorylates H2AX within the nucleosomes in an acetylation-dependent manner. Nucleic Acids Res. 31: 6819–6827.
. 2001. Histone H2AX is phosphorylated in an ATR-dependent manner in response to replicational stress. J. Biol. Chem. 276: 47759–47762.
. 2008. Complementary functions of ATM and H2AX in development and suppression of genomic instability. Proc. Natl. Acad. Sci. USA 105: 9302–9306.
. 2008. Lymphocyte-specific compensation for XLF/cernunnos end-joining functions in V(D)J recombination. Mol. Cell 31: 631–640. 2004. Selection of the T-cell repertoire: receptor-controlled checkpoints in T-cell development. Adv. Immunol. 84: 201–238.
. 2002. The mechanism and regulation of chromosomal V(D)J recombination. Cell 109(Suppl): S45–S55.
. 1991. Control of gamma delta T-cell development. Immunol. Rev. 120: 185–204.
. 2000. Brca1 required for T cell lineage development but not TCR loci rearrangement. Nat. Immunol. 1: 77–82.
. 2000. Abnormal development of Purkinje cells and lymphocytes in Atm mutant mice. Proc. Natl. Acad. Sci. USA 97: 3336–3341.
. 2006. ATM stabilizes DNA double-strand-break complexes during V(D)J recombination. Nature 442: 466–470.
. 2008. Aberrant V(D)J recombination in ataxia telangiectasia mutated-deficient lymphocytes is dependent on nonhomologous DNA end joining. J. Immunol. 181: 2620–2625.
. 2009. Formation of dynamic gamma-H2AX domains along broken DNA strands is distinctly regulated by ATM and MDC1 and dependent upon H2AX densities in chromatin. Mol. Cell 34: 298–310.
. 2001. A critical role for Dnmt1 and DNA methylation in T cell development, function, and survival. Immunity 15: 763–774.
. 2009. Histone H2AX stabilizes broken DNA strands to suppress chromosome breaks and translocations during V(D)J recombination. J. Exp. Med. 206: 2625–2639.
. 2011. Cellular context-dependent effects of H2ax and p53 deletion on the development of thymic lymphoma. Blood 117: 175–185.
. 2010. 53BP1 inhibits homologous recombination in Brca1-deficient cells by blocking resection of DNA breaks. Cell 141: 243–254.
. 2011. ATM damage response and XLF repair factor are functionally redundant in joining DNA breaks. Nature 469: 250–254.
. 2010. Antigen receptor allelic exclusion: an update and reappraisal. J. Immunol. 185: 3801–3808.
. 2010. ATM and p53 are essential in the cell-cycle containment of DNA breaks during V(D)J recombination in vivo. Oncogene 29: 957–965.
. 2006. Activation of p38 MAP kinase by DNA double-strand breaks in V(D)J recombination induces a G2/M cell cycle checkpoint. EMBO J. 25: 763–773.
. 2011. H2AX prevents CtIP-mediated DNA end resection and aberrant repair in G1-phase lymphocytes. Nature 469: 245–249.
. 2007. Defects in coding joint formation in vivo in developing ATM-deficient B and T lymphocytes. J. Exp. Med. 204: 1371–1381.
. 2009. ATR and H2AX cooperate in maintaining genome stability under replication stress. J. Biol. Chem. 284: 5994–6003.
. 2007. Lack of Bcl11b tumor suppressor results in vulnerability to DNA replication stress and damages. Oncogene 26: 5840–5850.
. 2007. Haploinsufficiency of Bcl11b for suppression of lymphomagenesis and thymocyte development. Biochem. Biophys. Res. Commun. 355: 538–542.
. 2005. Molecular genetics of acute lymphoblastic leukemia. J. Clin. Oncol. 23: 6306–6315.
. 2005. Relation between genetic variants of the ataxia telangiectasia-mutated (ATM) gene, drug resistance, clinical outcome and predisposition to childhood T-lineage acute lymphoblastic leukaemia. Leukemia 19: 1887–1895.
. 2003. ATM gene alterations in childhood acute lymphoblastic leukemias. Hum. Mutat. 21: 554.
. 2004. Germ-line ATM gene alterations are associated with susceptibility to sporadic T-cell acute lymphoblastic leukemia in children. Genes Chromosomes Cancer 39: 161–166.
. 1998. The ATM gene and susceptibility to childhood T-cell acute lymphoblastic leukaemia. Br. J. Haematol. 103: 536–538.
. 2001. A complex pattern of recurrent chromosomal losses and gains in T-cell prolymphocytic leukemia. Genes Chromosomes Cancer 31: 248–254.
. 1998. Inactivation of the ATM gene in T-cell prolymphocytic leukemias. Blood 91: 3920–3926.
. 2009. Molecular allelokaryotyping of T-cell prolymphocytic leukemia cells with high density single nucleotide polymorphism arrays identifies novel common genomic lesions and acquired uniparental disomy. Haematologica 94: 518–527.
. 2006. Prolymphocytic leukemias. Semin. Oncol. 33: 257–263.
. 2009. Recent advances in cancer therapy targeting proteins involved in DNA double-strand break repair. Clin. Cancer Res. 15: 6314–6320.
. 2010. Harnessing the complexity of DNA-damage response pathways to improve cancer treatment outcomes. Oncogene 29: 6085–6098.
. 2009. Targeting the DNA damage response for cancer therapy. DNA Repair (Amst.) 8: 1153–1165.
. 2008. Advances in the understanding of mantle cell lymphoma. Br. J. Haematol. 142: 149–165.